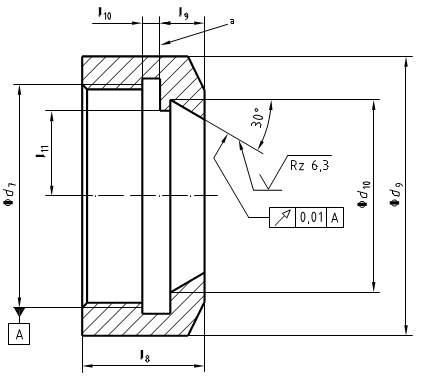 Table 4 specifies collet run-out tolerances. 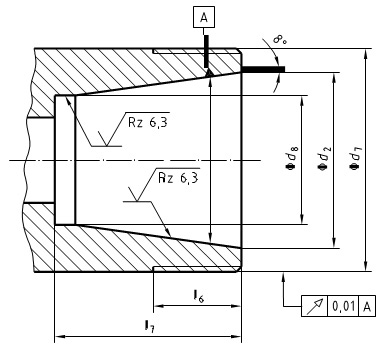 These tolerances are checked as is shown in Figure 4 by the introduction of a test mandrel into the collet. g) surface hardness: (58  3 ) HRC. a) Normal style collets are designed with run-out tolerance class 2. 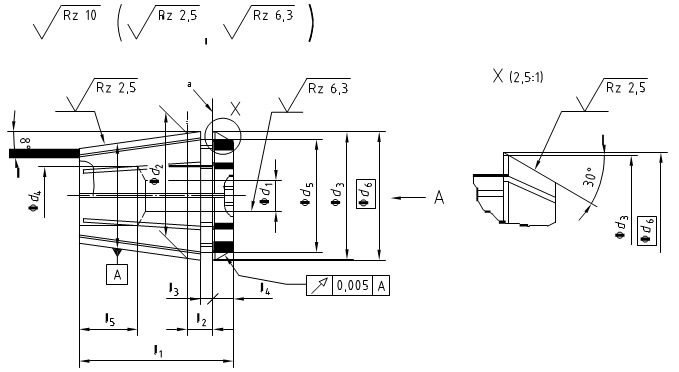 If class 1 is required, it shall be given separately, see 5.1.
b) In the case of applications where run-out tolerances class 1 are required, the accuracy of the whole system (machine tool spindle, holder, collet and tool) shall be observed. 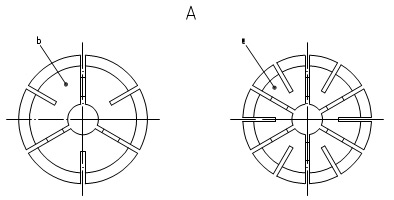 See Figure 1 and Table 1.
b. Form A, 6 to 8 slots..
c. Form B, 12 to 16 slots. 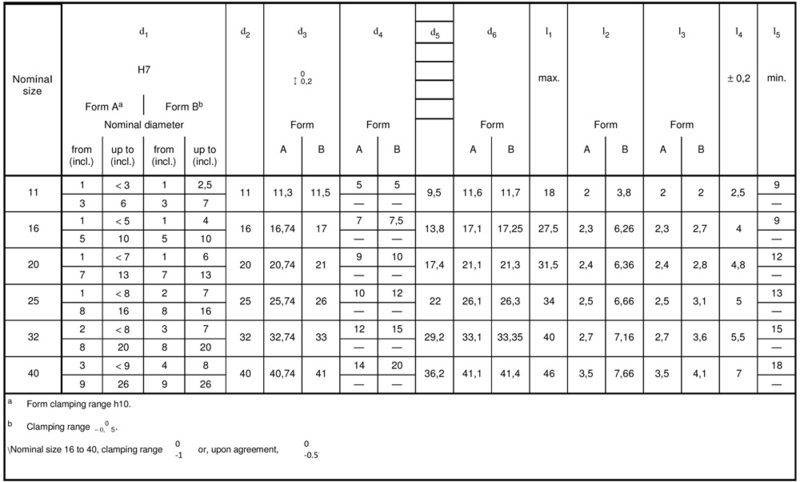 See Figure 3 and Table 3. Nominal size d7 6H d9 d10 l8 l9 l10 0 − 0,2 l11 max. This annex specifies the values for AT3 tolerance (see Table A.1) and AT4 tolerance (see Table A.2) from ISO 1947:1973, System of cone tolerances for conical workpieces form C  1:3 to 1:500 and lengths from 6 to 630 mm, which has been withdrawn. AT D is calculated from the constant AT α value within a range of cone lengths. 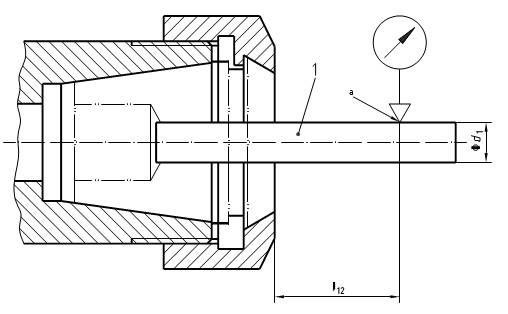 ATD is calculated from the constant AT α value within a range of cone lengths.